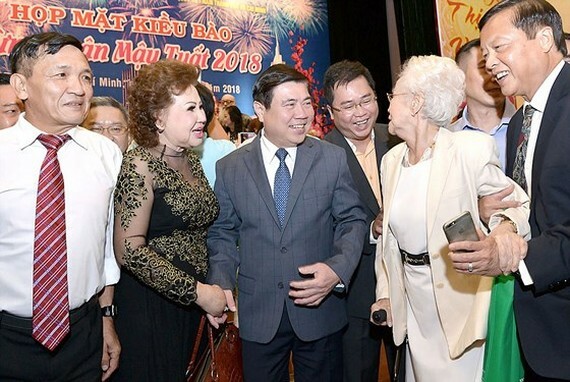 HCMC Party Committee, People’s Council, People’s Committee and Vietnam Fatherland Front Committee last night organized a meeting with nearly 800 overseas Vietnamese from 25 nations and territories in advance of the Tet holiday. On behalf of the city Party Committee, government and residents, chairman of the city People’s Committee Nguyen Thanh Phong welcomed the overseas Vietnamese who have returned their homeland and wished them a happy Lunar New Year. Talking about socioeconomic development achievements and overseas Vietnamese operations last year, chairman Phong said that HCMC overcame many difficulties and challenges to obtain and exceed important social and economic norms. Tan Son Nhat International Airport received over 411,000 overseas Vietnamese and US$5.2 billion was remitted to the city, up 6 percent over 2016. 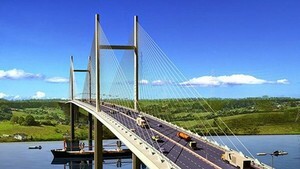 After the city coordinated with the Ministry of Foreign Affairs to successfully organize a conference themed “Overseas Vietnamese join hands to develop HCMC fast and sustainably”, the municipal authorities have required authorized agencies to study and consult the city on implementation of 47 ideas and projects sent from overseas Vietnamese. The achievements which HCMC obtained last year had the important contribution of the community of Vietnamese abroad in general and overseas Vietnamese in HCMC in particular. Overseas Vietnamese is an integral part and resource of the Vietnamese nation, said chairman Phong. 2018 is the first year when the city implements Conclusion 21 of the Politburo and Resolution 54 of the National Assembly on piloting specific mechanisms for HCMC development. To obtain set targets, Mr. Phong stressed that HCMC does need the contribution of nationwide and city wide residents and the community of over 4.5 million Vietnamese people abroad. He hoped that overseas Vietnamese will continue promoting the patriotic spirit and tradition to join hands with the city Party Committee, government and residents to win economic and social targets in 2018 and develop HCMC into a civilized, modern and humane city having good living standard. Entrepreneur Chau Ba Long, overseas Vietnamese from Australia and director of Minh Nguyen Company in Saigon Hi-Tech Park, said that he and other overseas Vietnamese are an integral part of the Vietnamese nation. Overseas Vietnamese have made efforts to successfully integrate in the countries where they are living and have a strong attachment to the fatherland. He felt the warmness and attention of the Party, State and HCMC authorities to overseas Vietnamese. The attention has not only stopped at creating advantageous conditions for overseas Vietnamese to live, work, study, do charity work and invest in Vietnam but also provided the spiritual care to overseas Vietnamese in the transfer moment of the old and new year. Mr. Long affirmed that he and overseas Vietnamese wanted to contribute more projects and ideas for the country and the city's development. All of them will join hands to ignite the pride of the Vietnamese nation.